We have had a small electric mulcher for quite a few years but a while ago it reached the end of its life. We have been using our lawn mower to mulch in the meantime but now have decided to invest in a petrol mulcher/chipper. I am wondering if any members have had the pleasure of owning one of these beasts and if so is anyone prepared to pass on any information that may be useful before we spend our money. There is no perfect mulcher but there are some things you can look for that will help you to get something that suits your needs. Firstly, forget electric ones: they are just hopeless for any real garden work. The best mulcher I had was an MTD. When mine wore out after 10 hard years of work I couldn"t get one exactly the same, and after trialling two other brands went for a Hansa (Pictured). Both had similar 5HP engines and both would mulch and chip up to 60mm branches but the MTD had a seperate chute for chipping. 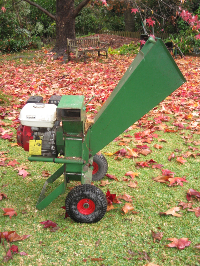 It produced the finest mulch and chips as it also had steel flails on the flywheel that pulverised the mulch. The upright design which feeds into vertically rotating flywheel/blades is important especially when you need to do a lot of leaves and loose clippings. Avoid designs that require the material to be fed in sideways; that require fiddling with spanners etc. to get access to the blades to clear blockages; and don"t have much suction into the feed chute. However the best are not cheap - $1000 to $2000. Just so you know what I am talking about, avoid designs like this one with the horizontal flywheel. I don"t know this brand so my comments dont apply to it specifically - just the style. Also look carefully at plastic components and how they are fastened to the machines body. There is a lot of vibration and a lot of force when doing branches so everything around the cutting blades needs to be solid. Great to have an actual gardener discuss these products. Salespeople are only helpful to a certain extent. I have now discounted the Greenfield after what you have said. I am interested in what you said about sending the mulch off to the compost heap. That action actually put me off the Hansa. I usually put my mulch straight onto the garden and thought it would be better to have one that dropped it under the machine into a neat pile. Better still would be into a catcher bag but I haven"t found one with that feature yet. The one I am leaning toward is a Deutscher. Do you know anything about that brand. Choice is always a very personal thing. I suppose it really depends on how much material you need to mulch and whether you plan to let it decompose before use. 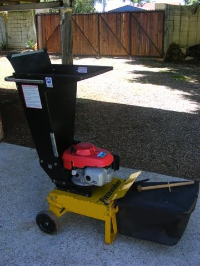 These petrol powered mulchers can handle fairly high volumes and blast it out quite quickly so aiming it at your garden bed may not be a good idea. Also you have to ask - am I going to bring the prunings etc to the mulcher as I move it around the garden or is it better to accumulate the prunings and leaves and do a big mulching session as we regularly need to. (For us a catcher bag would be very annoying). Thanks for the great input. Decision made and mulcher purchased. We went for the Deutcher in the end. Now having a lot of fun working through a huge pile of clippings and leaves. The resulting mulch is very fine so it will decompose quickly, and I will help this along with lots of hoeing. If I need a courser mulch in the summer there is an alternative grate which produces a chunkier material. It doesn"t seem to like wet material so it is not perfect but I am pretty happy with it so far. Thanks again I enjoyed the discussion. Mulcher feedback - we are delighted with our mulcher which has given us excellent reliable service over 18 years using it bi-weekly for approx 4 cu.m of green waste, including all our household vegetable/fruit scraps. Our machine has a 10.5hp Briggs & Stratton engine,is a Greenfields Piecemaker - more like the one you didnt like. We would buy the same again. We collect material in 5 wheelie bins, work on our driveway, dont use the bag (due to volume) allow the superfine mulch to blow in a mound on the drive to barrow to our compost pits. Takes approx.15 mins to empty 1 350 litre bin. If clogs, it unscrews easily and tips right back for easy access to blades. I get super compost in 3 weeks by layering 1 barrow new, 1 handful of blood & bone, thin layer of previous compost repeated to fill compost pit. Love it! Hi Suzanne,we work on our driveway too which is the lowest point of our steep block. It seems most people compost the mulch but I put it straight on the garden. I have a friend who has a lawn mowing business and he is bringing me his clippings which I also put straight on the garden. I don"t heap it on and I do hoe a lot but maybe I should be composting first....I hope I get 18 years of reliable service from my mulcher, you sound pretty happy with yours. Beware of the Yardeco Company. They sent me a faulty machine and then were extremely rude in dealing with this. They seem to be a bunch of blokes in a shed with poor quality control, appalling customer service and misogynists at heart!